Customized for Shared Harvest Deep Winter January 2016 Share box! Follow the links to find the recipes online. Thanks, Jackie! Soup: Lebanese lentil soup with potatoes, greens, and lemon. Use spinach or winter greens for roasted parsnip and date salad, serve with beet risotto. 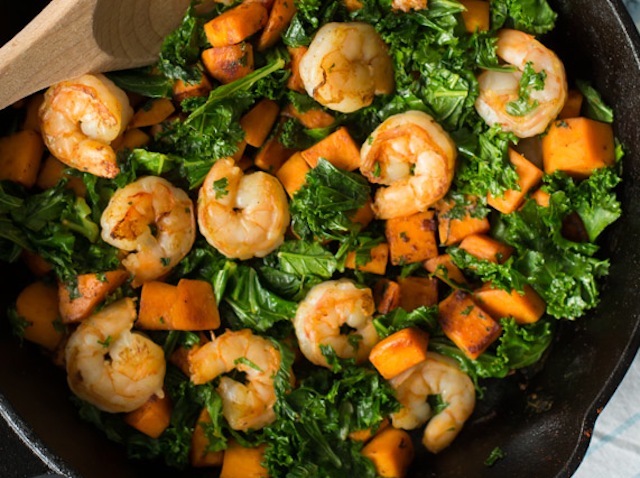 Sweet potato, kale, and shrimp skillet. Carrot puttanesca (on pasta or grain) with a kale caesar salad (with anchovies or vegan). Smoked paprika potatoes and egg bake. Soup: butternut squash with miso and coconut. Winter vegetable tofu korma with kohlrabi in place of cauliflower. Roast a chicken, spatchcocked, laid over cubed carrots, parsnips, and potatoes (or other root vegetables). Season the chicken wtih salt and pepper. Toss the vegetables with salt and olive oil, lay thyme and rosemary sprigs. Lay chicken over it and roast at 425 until the juices run clear, ~40-60 min depending on size. Vary root vegetables as you like. Cut vegetables that take longer to cook, such as carrots, in smaller pieces than shorter-cooking vegetables, such as potatoes. Serve with a shredded kale and cabbage salad—I like the combination with sliced mushrooms and apples, with lemon tahini vinaigrette (mix lemon juice, salt, olive oil, and tahini to taste). Use leftover chicken for sesame chicken & celery root salad. Bean salad with carrots and almonds (use jacob’s cattle or other beans from the share). Serve with warm cabbage salad with lemon-garlic-cashew dressing. Beet and leek fritters with yogurt and lemon (I’m sure onions or shallots will substitute fine for leeks). Serve with leftover soup or a shredded vegetable salad. am I used 1/2-1 tsp pureed chipotle peppers in adobo, 1/2 tsp sweet paprika, 1/2 tsp smoked paprika. For tomatoes I used a 15-oz can fire-roasted tomatoes. Cornmeal-crusted tofu with mashed sweet potatoes. Warm lentil and potato salad, serve with quick pickled radish and black olive bruschetta with cashew cream (or ricotta). Carrot ginger sauce served on scallops or fish. 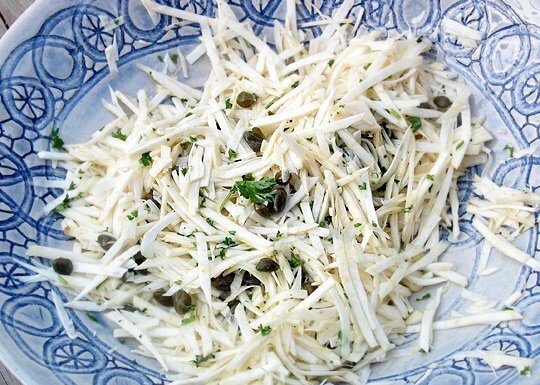 Serve with a quick celery root salad. Have leftover soup with a caramelized onion pizza. Use butternut squash in this roasted pumpkin salad.